During my exchange semester at Bocconi University, I had a really interesting course. This dealt with the impact of social movements on firm strategy. There were numerous case studies on how unethical and environmentally harmful practices by firms were targeted by organizations like Greenpeace, leading to fall in stock prices, sales, brand equity and so on for the companies concerned. Nearly every major brand, right from Walmart, Nike, Adidas, to Zara, Ford and Kimberly Clark (makers of Kleenex) have undertaken (knowingly or unknowingly) unethical practices in search of higher profits, and have suffered the consequences at one time or another. The mishap that lead to deaths of close to a thousand workers in Bangladesh last month made me notice something different from the usual sequence of events that I had noticed in the several case studies. A lot of brands like H&M (Walmart not among them), quickly came to an agreement to improve their practices in the hope of preventing another such occurrence. This was in the absence of any organization targeting these brands. The brands were forced to act simply because of all the bad press they were receiving from many independent bloggers and magazines. There was no need for a planned and targeted effort from an established organization like Greenpeace. This makes me question the relevance of such organizations in today's connected world. In fact, these organizations are realizing this as well and are changing the way they act in this social, connected era. A couple of years ago, Greenpeace brought out thoroughly researched findings about the pollution being caused by Chinese manufacturers whose clients include Zara, Marks & Spencers, and Puma, and called it 'The Dirty Laundry report'. This was unlike its previous campaigns where it had reacted to actions first and then attempted scientific research to back them. This just shows that it is much easier to target companies for their malpractices than it was a few years ago. That is bad news for brands. 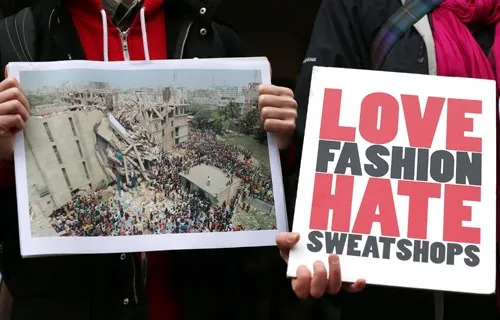 The same brands that were sending out messages to victims of the Boston marathon, were guilty of following practices that lead to the tragedy in the factories of Bangladesh. It is disappointing that a giant like Walmart has been skirting responsibility and has refused to sign a legally binding agreement that aims to improve practices along the entire supply chain. As long as an organization is driven by profits alone, we will continue to see this. I'm sure the people who sanction such practices are 'just doing their job' of optimizing for ever lower costs and higher profits. But if just doing your job leads to the death of the brand, there will be no job left. Nice one Kumi. Really love reading your articles. This one leads us to some fundamental ideas on commerce and economics. The analytics driven approach to cost reduction does not account for the value you need to pay for human dignity (something that really can't be standardized, even by Mr.Ahluwalia).